The Dark-backed Weaver was formally described by Louis Jean Pierre Vieillot, a French ornithologist. Vieillot already described it under a different name in 1818, but the name was not valid, and at first he thought it came from America. 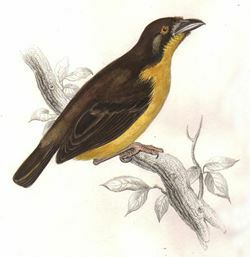 In 1819 he gave the valid name and noted that the specimen came from Senegal, but the Dark-backed Weaver does not occur west of Cameroon as was thought by early authors. Shelley 1887 first realised that the actual type specimen in Paris fitted birds from eastern South Africa, and later this was further restricted to the Eastern Cape. The Dark-backed Weaver was first collected by Francois Le Vaillant, who travelled in South Africa in 1781-84, and reached the Eastern Cape in 1782, where the Dark-backed Weaver occurs. 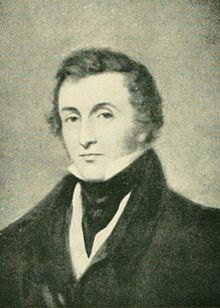 When Le Vaillant returned to Europe, most of his specimens where sold or given to Coenraad Jacob Temminck, who had sponsored Le Vaillant's travels. Temminck produced a catalogue of these birds in 1807 and briefly described the Dark-backed Weaver, without providing a scientific name, but calling it "Le verdier a ventre jaune" (Greenfinch with a yellow belly). 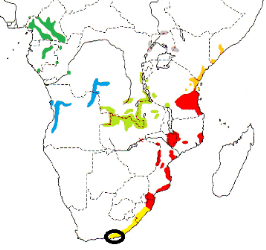 He noted that it came from "Africa, Cape of Good Hope" (which includes the Eastern Cape). Later Jacques Pucheran (1854), a French zoologist, noted that the Dark-backed Weaver type had been in the collection of Louis Dufresne, a French ornithologist and taxidermist at the natural history museum in Paris. Either the type had been transferred or Le Vaillant had more than 1 specimen, and kept one for the Paris museum, since Le Vaillant was friends with Dufresne. The collection of Louis Dufresne was sold to the University of Edinburgh in 1819 (and later moved to the Royal Scottish Museum). The first illustration of this species to be published, was by William Jardine in 1836, a Scottish naturalist, who had access to the Scottish collection. In addition to the Dufresne specimen (Jardine did not know the apparent source as Dufresne), Jardine also had other specimens from Dr Andrew Smith. Ploceus bicolor	Vieillot 1819	Nouv. Dict. Hist. Nat., nouv. ed., 34:127	Senegal, errore = S Africa, vide Hartert 1907a. Restricted to Zuurberg, Addo, E Cape by Roberts 1931.
bicolor Latin: bicoloured, two coloured (bi-, twice, double; color, colour). Black-backed Weaver, Forest Weaver, Grey-backed Weaver, Hinge Bird, Solitary Weaver-bird, Spot-headed Weaver. 1782, when Le Vaillant was in the Eastern Cape. Type specimen may be in the Royal Scottish Museum.